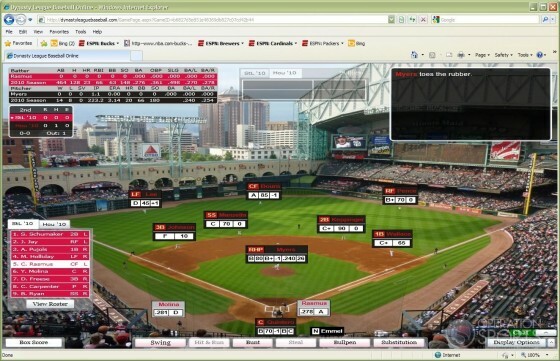 Last fall, I provided an overview of Dynasty League Baseball Online, a browser-based baseball simulation (www.dynastyleaguebaseball.com). Since then, the game has seen the addition of some new features; the biggest is a league mode featuring some of the greatest teams of all time. The basics of this game have not changed since I wrote about it in November. Dynasty League is a dice-based game, heavily based on statistics. It easily and efficiently runs in a browser, with customizable display options and a simple but intuitive interface. You can play against an AI opponent or other humans via live tournaments and leagues. The new Greatest Teams Leagues are the most lauded addition to the game's list of options. Essentially, you select a team from a list of the greatest teams of all time. Team selection is pretty balanced both chronologically and geographically, but most of the teams in my sample league were from the latter quarter of the century. Games are scheduled well in advance, and it's easy to reschedule games that may not fit your schedule. Should you (or your opponent) not make your scheduled game, the AI will take over. Games are also grouped into two- or three-game series, which leads me to one small complaint. If you play a three-game series, it can take a fair amount of time, especially depending on how long your opponent takes to make decisions. Again, your presence is not required, but it makes the game more fun. Basically, just be sure to leave enough time to enjoy the entire series. In talking with one of the programmers, it is easy to see how carefully the simulation engine has been constructed in an effort to re-create accurate and lifelike statistics. For instance, things that are not typically taken into account, such as pitcher hold times and situational hitting, are evident both numerically and in practice. Do not try to steal on a pitcher with a great pickoff move; don’t expect your lockdown pitcher to give up a home run with runners on. Ballparks play a huge factor as well, and they are statistically and visually accurate. The game is played “on” high-resolution pictures of classic or modern stadiums. Even more important are the effects that contribute to home runs, foul balls, etc. In all, what you get is perhaps one of the deepest and most well researched simulations available. Better yet, it is a browser-based and has live multiplayer -- probably the only game that can boast that title. It’s easy to see the level of depth and detail that the producers put -- and continue to put -- into the game engine. 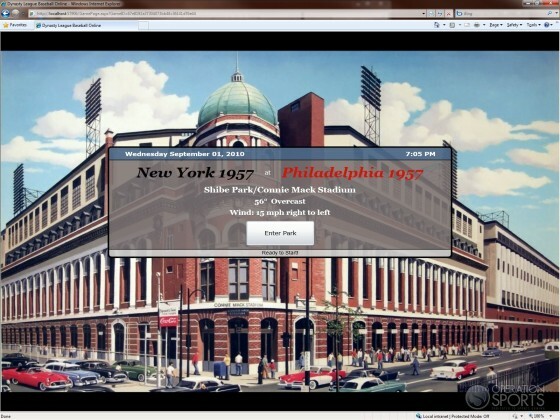 If you have not taken a look at Dynasty League Baseball Online yet, give it a try. The Greatest Team Leagues provide a truly unique experience. Oh, and "fantasy draft leagues" are coming soon as well.
? OOTP isn't browser based. First off, comparing OOTP to this genre of game is like comparing apples & oranges. Secondly, having played both, yes, this game is more "sim" than OOTP. By "sim" I mean player abilities and statistics are more accurately represented. Everyone will have their own definition of sim, however. Yes, from playing it, OOTP is less sim than this. This is on a different level than OOTP as far as simulating on the field action. This does not simulate the front office like OOTP. this is on the field simulation. Agreed. When talking a simulation of the on field baseball action this game is far beyond OOTP. Not even close. OOTP is in it's own class as a GM off the field sim, but from a strictly baseball played on the field perspective Dynasty League is on a whole other level. So, what kind of sample sizes are required to ensure that a pitcher is truly "lockdown"? When you start trying to replicate the minutiae of baseball, you run the risk of replicating luck, rather than true skill. Good question. There is a special "JAM" pitcher situation rating and primarily only ERA qualifiers or Save leaders are candidates to be awarded the JAM pitcher situation rating. For the ON and OFF ratings the qualifications are not as stringent, but for the reasons you mention we manually review the pitcher ratings to make sure the pitcher "earned" the rating. Without these three special pitcher situation ratings (JAM, OFF and ON) you can't realistically replicate a pitchers ERA. I love the product that you guys have put out. But with family and work, it is hard to dedicate time to do tournaments and franchise leagues. Any thoughts on putting an option for users to be able to run a solitaire league with the product. I would definitely subscribe for the ability to do that. I realize that you guys have a single player game for people to purchase, but I would prefer the subscription method and pay for the ability to play any season I want. Again, congratulations on the product, it is really really fun, just not sure I can get enough value out of the gameplay for $15 a month. Also for the single player game is there digital distribution or do you only do mail order. One last question does the single player game have card images and the die rolls just like the online version? Great to hear you love DYNASTY League Baseball! The Greatest Team bracket tournaments are short format in that they are single elimination and there is a regular daily schedule of tournaments you can join. The Greatest Team 54 game league option plays either one two or three game series a week and has flexible reschedule options. If you have time to play solitaire "Series" you would also have time for the multi-player tournaments and leagues. The idea behind the Online version was to make it easy for busy people to play in leagues and tournaments and take the time consuming drudgery out of multi-player leagues by eliminating things like having to export and import files to a central commissioner. Having said all that, the Online version does have a solitaire "Series" play format as well where you have access to the entire library of DYNASTY League Baseball seasons. There also is a discounted $11 per month rate if you select six months. I will be honest. I am sad my trial is over, BUT, I'm going to try a month of this online stuff. OOTP is way too much GM stuff for me. I LOVE your game play, and having the stadiums already there, and not having any mods to add. I have actually already purchased another baseball sim game this year, but I'm STILL doing your game as well. Thanks for such a great game! Great to hear Danny! See you in some of the Greatest Team multi-player bracket tournaments. You are right about making things easy and not having to bother with installation, mods, imports and exports. Just log in and start playing! We just added the 1974 season last week by the way and all seasons have actual vs. LH and vs. RH splits vs. ptichers and hitters which is critical in making a realistic baseball simulation. This game sounds pretty fun. I might have to give it a try. I have enjoyed playing in some of the greatest teams tournaments. The head to head games have, at times, been intense and a lot of fun (no connection problems whatsoever), but my main interest would have been in the draft leagues. I’ve been lobbying hard on other forums to get Mike and Jamie to consider computer manager/ netplay optional formats. It would be pretty tough to free up a couple of hours every week to play a series head to head with families and work commitments. I would love to take part in a 162 game draft league and it’s doable if a person can play exactly when they want. Today, I’m up at 5 in the morning. Toast and coffee in the morning before heading off to work, enough time to play a few innings against my opposition’s computer manager. I can finish off the game when I get home after work before the kids get home. Up late on another occasion…1 AM, love to play a game and one that matters..…a league game, I can play the opposition’s computer manager. Next Thursday night, everyone else in the house is busy and that frees up some time, I’ll get a hold of the opposition’s manager and ask him if he would like to netplay a double header! Have leagues that are netplay optional…they will be far more popular than leagues that essentially force you to play your games head to head at set times. Sometimes you want to zip through your games, sometimes you want to take your time and spend some time gazing over and dissecting your opposition’s cards, sometimes in the middle of a game I want to refer to my Baseball Prospectus to look at the scouting reports of a specific player….all of these instances lend themselves to the computer manager/ netplay optional format. I really want to get involved in a 162 game draft league with Dynasty but without this kind of flexibility, I'll probably be sticking to a couple of stable OOTP leagues. OOTP is a great game, too, but it's a completely different experience, one that I immensely enjoy but I am definitely more of a Stratomatic/ Replay/ Pursue the Pennant type of guy. Current season continous draft leagues are coming later this Spring and will have an integrated live draft room. 1) Select an option that indicates you will play the game at a time of your choosing against the computer manager. This will let your opponent know they are not involved in a multi-player game. 2) Indicate you are going to play the game at the normal time and your opponent can show up for a multi-player game. B) If you don't choose anything by game day, the 162 game league scheduling options will just operate like a 54 game league. The options presented are great, Mike! I think back to my first baseball sim, APBA's 1979 season, and since then it's been an incredible journey. I played random stock team games, draft teams for tournaments etc. and I went the computer route in 2005. I no longer play with the cards and dice which, to me, are unmatched. Life is busy, though, and most of my projects since 2005 have been tournaments and best of 7 series. I really want to experience league play again and my Stratomatic computer league experience was unsatisfactory. I have been waiting for one of the text sim games to utilize a server for league play for more than a few years and I am thankful that a quality sim like Dynasty has decided to go that exact route. I can hardly wait! I really wish you still offerred dynasty league as a stand alone PC sim for solo players. I'd be all over it in a heartbeat. Why not both options to statisfy everyone? DYNASTY League Baseball Online does have solitaire options even though the uniqueness of it is the real time multi-player leagues. Solitaire players can play any Series from the library of seasons vs. the computer manager or a friend. You can also create your own Private League and assign each of the other teams to be managed by the computer manager or a friend and run your own season replay. Private Leagues are primarily set up for real time multi-player draft leagues. You can use the Commissioner Tools to create your league, edit rosters and build your schedule. The Private League Directory lists all leagues and those looking for new players. Here is the link to the Private League Directory where you can find a multi-player draft league or season replay league.